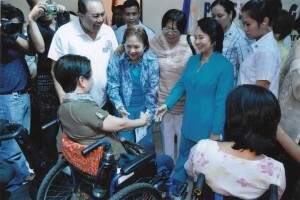 President Gloria Macapagal-Arroyo shakes hands with one of the women with disabilities during her visit last February 18, 2010 to the newly constructed two-storey building of the National Council on Disability Affairs. The Council has been transferred to the Office of the President by virtue of Executive Order No. 709 which was issued by President on February 26, 2008. It is vested with powers and functions as a policy making, coordinating and monitoring agency of the government on disability related matters and propose legislations concerning the rights of persons with disabilities in the country.